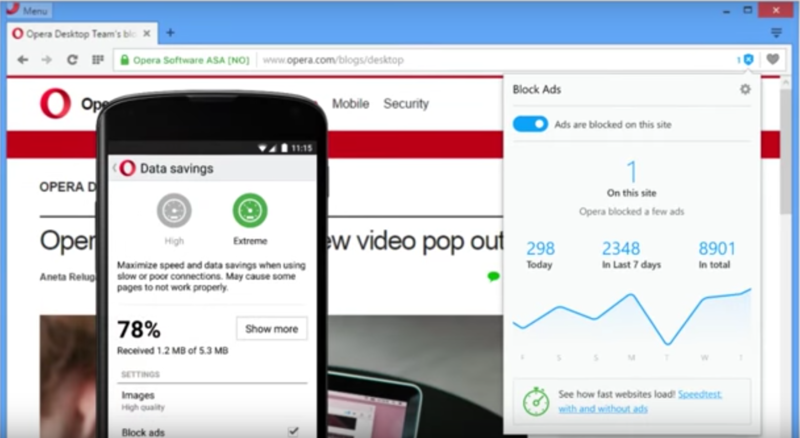 Opera has added the ability to block ads in its browser. So, you do not need to download any other third-party extension on Opera to block ads. If you are one of those people who do not want to see ads, you can use Opera browser and surf the web without ads. Opera also offers free built-in VPN to allow you surf the web anonymously. This is why I personally like Opera. In this article, I will explain how to enable ad blocker in Opera and how to use it properly. Why should you not use Ad blockers? Before you read more about blocking ads on Opera, I want you to first read why should you avoid using ad blockers. You are thinking to block ads because you are irritated with ads around every corner of the website. There are many spam websites, software downloading sites, torrent sites and more which show too much ads. But not all websites show this kind of ads. Publishers like use show ads to earn revenue. This revenue help us in paying our hosting bills and motivate us to continue our work. So, I recommend you to avoid spam sites and browse only legit websites and you will never feel irritation on the web due to ads. If you still want to block ads, I recommend you to whitelist those sites which you like. In this way, you will be seeing ads on those websites. It will help those publishers in continuing their work. I will also tell you how to whitelist a website on Opera’s ad blocker. There is nothing complicated in this. You just need to open Settings from the menu. In Mac systems, open Preferences. Now, navigate to “Privacy & Security” tab to see ‘Block ads’ option. Select the check box saying block ads and surf the web up to three times faster. It claims to speed up your browsing because removing ads make web page lighter and hence it loads faster. When you will enable, it will start showing a button saying “Manage Exceptions” just below the check box. It is used to manage the websites to allow or disallow from ad blocker. In simple words, it is used to whitelist a website. Once you have enabled the ad-blocker, start surfing the web. You will not see ads on any website. You will also see a shield icon at the rightmost side of address bar. Clicking on it shows number of ads it has blocked on the current page and stats of ad blocking. You know how to enable ad blocker in Opera browser and block ads on all websites. But, your ad blocker also hurts genuine publishers. So, we recommend you to whitelist few websites. If you are convinces, you should read more and learn how to add website in whitelist of Opera’s ad blocker. There are basically two ways to add a website in whitelist of Opera’s ad blocker. Direct from the web page you are browsing: If you want the easiest way, just see the shield icon at the leftmost side of the address bar. Click on it to open the pop-up window showing stats. You will also see a button just before the line “Ads are blocked on this site.” Click on this button to disable ads on the current website. It will turn from blue to gray once you disable the ad blocker on the site. From settings or preferences pages: Other way is to go on the same settings page where you initially enabled the ad blocker. Go to settings and then navigate to “Privacy & Security” tab. Here, you see a button saying “Manage exceptions”. Click on it and add all the websites you want to whitelist. See the text box saying “add a site”. Write the domain name of the site and press enter. If you want to whitelist all the subdomains of the domain, you should add [*.] in front of the domain. See the snapshot for the sample. Hovering any item shows x icon in front of it. If you want to remove a website from this list, just click on this icon. You can also remove a website from whitelist by clicking on that shield icon and then enabling ads on it in the popup window. Now you know how to enable native ad blocker of Opera browser. There is nothing complicated in the whole thing except the issue it creates for web publisher. I own few websites and earn only from ads. This kind of thing hurts our revenue and makes it hard to continue our efforts on building websites like Techlomedia and UseThisTip. So, we request you to whitelist Techlomedia, UseThisTip and QuickWebResources to help us grow. If you have anything to ask, do not forget to comment below.